These are simply the BEST, quick and easy yeast rolls you will ever make. 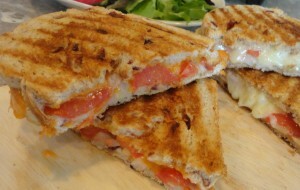 And make them you will, and often, because they are that easy and that incredibly yummy! Admittedly, I already had a tried-and-true recipe for quick dinner rolls but when these popped up in my Facebook feed I simply had to try them. 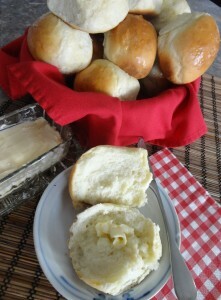 I have had favourable results with a lot of Kitchen Meets Girl recipes and figured this recipe for 30-Minute Dinner Rolls would be no different. I was right. I love being right, especially when it comes to food! Lightly spray a 9X13″ pan with vegetable oil spray. 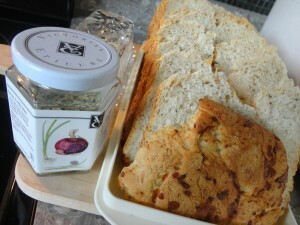 In mixing bowl combine warm water, oil, yeast and sugar. Using the dough hook, stir in 2 cups of the flour, salt, egg into the yeast mixture. Add remaining 1 1/2 cups of flour slowly, about 1/2 cup at a time, mixing well after each addition. On low speed, knead for about 5 minutes. Turn out onto lightly floured surface, gather into a ball and knead a few times, until smooth and elastic. Shape dough into 12 evenly shaped balls and place in prepared pan; cover with a clean tea towel and let rest for 10 minutes. Bake in preheated 400F oven for about 10 – 12 minutes, or just until the tops are golden brown. Remove from oven and turn out onto wire rack to cool slightly before serving. 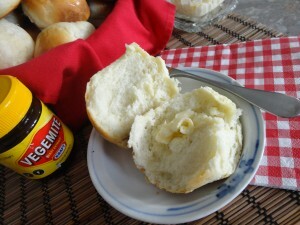 Oh, and BTW, they are absolutely incredible with Vegemite! 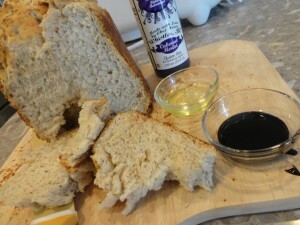 Best Ever Dinner Rolls with Vegemite – Yum!